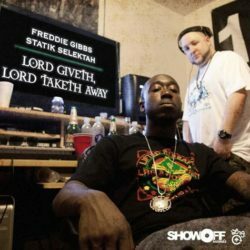 Originally released back in 2011, Lord Giveth, Lord Taketh Away, saw Freddie Gibbs team up with legendary East Coast beat maker Statik Selektah. The project was recorded in a single day, with the sessions being broadcast out on U-stream. Across the seven track EP, Gibbs showcases his hyper technical gangsta rap flow, stepping out of his comfort zone rapping over some classic NYC boom bap production. The EP features guest spots from Trae The Truth, Smoke DZA, Termanology and more. Omerta Inc. will be bringing this collaborative project to vinyl for the first time. As well as featuring the seven tracks from the original project, the vinyl release will include two bonus tracks, Crushin’ Feelings and Carry On featuring Joey Bada$$.